Your pet’s Grooming Salon visit starts with our Hands-on Pet Assessment. At check-in, a safety-certified salon associate will meet your pet and perform a thorough evaluation to ensure they are healthy and ready for pampering. Then, the associate will create a customized approach to address your pet’s unique needs and recommend solutions to be used during their bath or groom. Ears: We check for cleanliness, odor, signs of infection and other conditions. 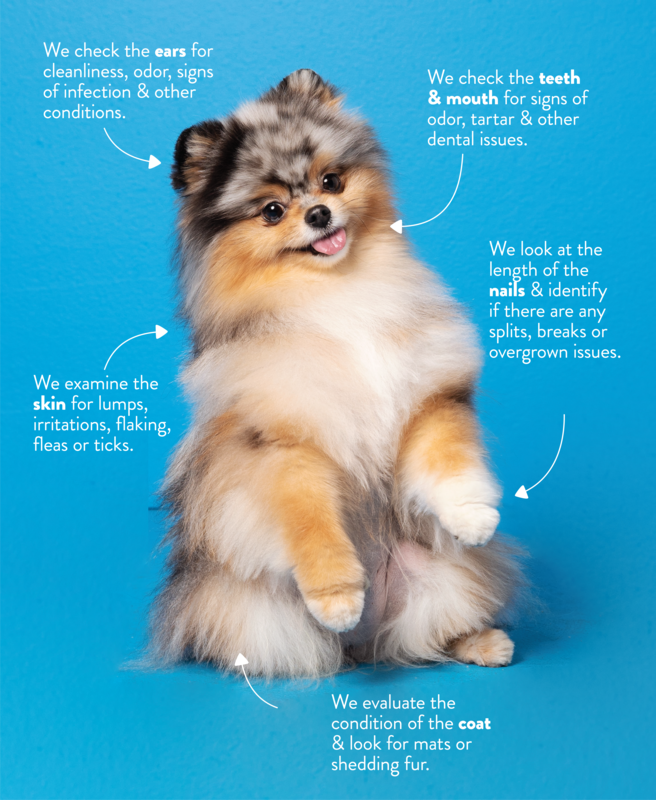 Teeth & Mouth: We check for odor, tartar and other dental issues. Skin: We look for lumps, irritations, flaking and fleas & ticks. Nails: We look at the length and identify splits, breaks and overgrowth. Coat: We check for mats and shedding fur.